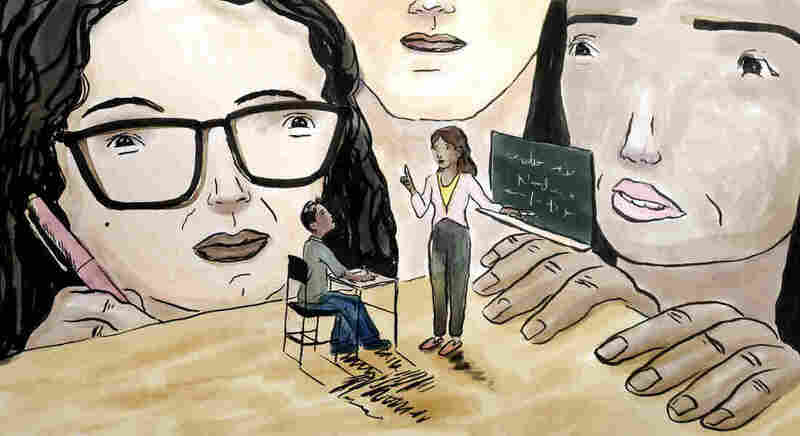 Having Other Teachers' Eyes Means Also Having Their Ideas : NPR Ed Being a teacher sometimes means shutting the door to your classroom and cutting yourself off from colleagues all day. So, these teachers are opening the doors again to learn from one another. A lot of what's going on today in Marna Wolak's fifth-grade math class is pretty familiar. She's got her students gathered on the rug for a number talk, something she does often, trying to get them thinking about fractions. But a lot of it is unfamiliar, too. The topic is new — dividing whole numbers by fractions. Also, today there are five more adults in the room, including two other teachers from Sanchez Elementary School here in San Francisco. It's clear students are a little shy because of the visitors, but still, they're humming along with the lesson. The fractions problem deals with origami stars. Wolak tells her kids they have six pieces of paper, but it only takes one-fifth of a piece to make one origami star. So, how many stars can they make with six papers? As they get to work, the observing teachers scribble detailed notes about the strategies kids are trying, where they might be going off track, and later, how they do discussing their thinking in a small group. "I'm noticing a student taking an example from the number talk and saying one-fifth times six is one-thirtieth," says third-grade teacher Lauren Christensen in a whisper to another observer. But then she notices the student starting to draw and suggests, "maybe there was a feeling of, 'I don't think that's the correct answer, so I'm going to try another way.' "
This detailed observation of student work is the focus of a professional development method for teachers called lesson study, popular in Japan and gaining traction in the U.S. The idea is that Wolak can better understand how her students are thinking by having other teachers in her classroom focused on the students' reactions instead of evaluating her instruction. The observers are looking for misunderstandings, but also interesting ways students approach problems and how well they can talk through their work. Today, many students in the class get the correct answer, but fewer are able to explain why. After the lesson the adults huddle to debrief what they saw by identifying trends and offering ideas. There's a consensus that the number talk on the rug at the beginning of the lesson may have confused kids, making them think they were supposed to use a number line even though that strategy wasn't helpful to solve this problem. The hope is that Wolak and the other teachers can use this information as they plan future lessons. Also, that the ideas aren't intuitive; they aren't something Wolak would have noticed without her colleagues' input. "Our goal is higher student achievement and we're not going to achieve that in isolation, I feel," she says. "That invigorates me." After each observation the teachers discuss what they saw and brainstorm ways to keep pushing their students on those skills. "What you learned trickles into other lessons. If you're interested in improving teaching and learning in your classroom then it's worth the time," says Wolak. "It's really powerful to have other educators' ideas," says Lauren Christensen. "I always learn something new. And it always causes me to think in another way." Even though Sanchez Elementary has a collaborative school culture, teachers are still often alone in their rooms with their students all day, which can make it hard to approach their jobs in fresh ways. "You can get so wrapped up in this own little world of yours with the students you teach," admits Christensen. "The opportunity to see how another person is teaching, and to see what's working or not working is really invaluable." Increasingly education leaders are seeing lesson study as a powerful way to grow teacher-leaders willing to try new things and continually improve, but it takes a lot of time and resources, too. In order to give them the time they need, the school or district has to pay substitute teachers and allocate planning time. Here, at Sanchez, though, the principal is on board and has decided to allocate money and time to implement lesson study school-wide as a central part of its teacher training.